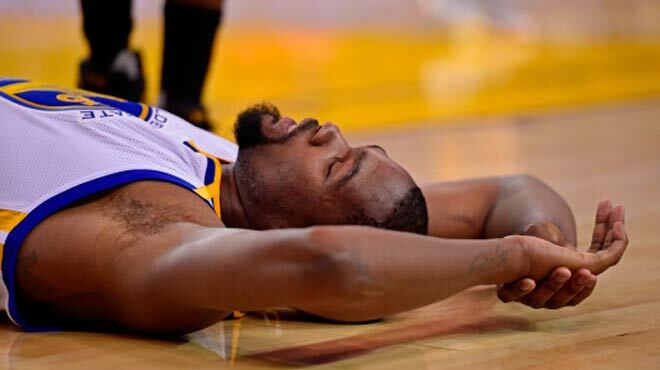 U.S. Sportsbooks still favor the Golden State Warriors to win division, conference, and league even though Kevin Durant will be out indefinitely with a Grade 2 Medial Collateral Ligament (MCL) sprain and a tibial bone bruise. As a result the Warriors have been temporarily demoted from a super team to a regular team – albeit pretty much the same team that won a championship in 2015 and set a new win-loss record, err, record in 2015–16. Put another way, the rest of the teams in the NBA have little to gain from KD’s injury other than a Roman holiday. This state of affairs is not surprising at all, though. Golden State was an odds-on favorite even before they lured Durant away from Oklahoma City. As a matter of fact, signing the eight-time All Star was just overkill. Of course, after choking harder than Papa Doc in ‘8 Mile’ in the NBA Finals against the Cavs, one could hardly blame them for overcompensating. Furthermore, some might say that the addition of KD messed up the Warriors’ feng shui. For example, Golden State has already lost as many games this season just after the All Star break as they did the entire previous season, including the one against the Wizards on Tuesday in which they lost Durant in the first quarter. Sure, KD leads the team with 25.3 points and 8.2 rebounds per game, but all things considered he has made an impact of only +1.8 ppg. By way of comparison, the 2015-16 Durant-less Warriors scored 114.9 points per game and allowed 104.1 points per game for a +10.8 point +/-, whereas the 2016-17 Durant-able Warriors score 118.1 ppg and allow 105.5 ppg for a 12.6 point +/-. In U.S. sportsbooks language, that means about 2 to 3 points to the spread without Durant. Any other team that lost its franchise player would be fubar; the Thunder without Russell Westbrook, the Cavs without LeBron James, the Warriors without Stephen Curry. Which is to say, GS has not lost its franchise player, who is supposed to be Curry. In other words, the Warriors losing KD is like the Rockets losing James Harden but not James Harden’s beard. In addition to Curry, Golden State still have Klay Thompson, Andre Iguodala, Draymond Green, and Zaza Pachulia – a lineup that is +41 in points and +.275 in efficiency field-goal percentage against opposing teams. The Warriors’ bench is not as deep as it was last year, though – and that’s a direct consequence of Durant’s arrival. There is no timetable for his KD’s return, and he will be re-evaluated in four weeks. During that span the Warrior have scheduled visits to Chicago, San Antonio, OKC, Dallas, and Houston, and will host Boston, among other commitments. Golden State’s performance review should wait until at least a few of those dates have come and gone. In theory, there should be no cause for concern, sportsbooks-wise. And in any case, the Warriors can take a quantum of solace in the knowledge that they have roster that can reach the NBA Finals. Not necessarily win them, but definitely reach them.